According to the National Association of Realtors' Housing Affordability Index, 2012 was a record year for housing affordability. The release of their results led to articles with titles such as "Housing Today Is More Affordable Than At Any Time In History" on an investment blog and "2012 a banner year for housing affordability, industry group says" in a major national newspaper. I've also seen several TV reports that covered how affordable housing has become. 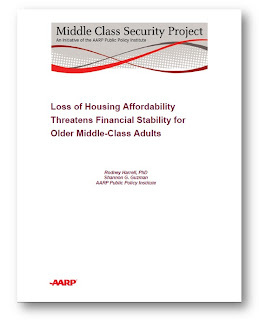 If that's the case, then how could we release a paper titled "Loss of Housing Affordability Threatens Older Middle Class Adults" as part of AARP's Middle Class Security Project? I'm not going to focus on all of the details, but yes there are data differences: our paper focused on the 50+ middle class only, looked at a different time frame, and used different datasets than the NAR study. More important than all of that is what we meant by "affordability." When I investigate housing affordability, I want to know whether people can afford to stay in their homes on an ongoing basis. NAR is focused on home sales, and their index focuses on the purchase of a home. Our look at housing affordability focused on homeowners (and renters) who are already in their homes and may have trouble keeping those homes. These families may be dealing with stagnant incomes, increasing taxes and fees, along with higher utility bills and other costs of housing. Affordability is not a one-time question about purchasing a home - it is an ongoing concern, each month, for a large number of families. If a healthcare emergency or another unexpected and costly event hits these families, they are increasingly in danger of not being able to pay next month’s mortgage or rent. Simply put, many older adults (and for that matter, younger adults) are facing more unaffordable circumstances today than they were at the turn of the century. Groups such as the AARP Foundation have focused on housing because "many find themselves forced to choose between paying their mortgage or rent and buying groceries or medicine. Many may be able to purchase a home, but increasingly, they are in danger of not being able to keep it." Our latest AARP PPI Study shows that affordability is still a concern, despite the upbeat news from those on the production and sales side. For more on the AARP Middle Class project, go to aarp.org/middleclass and read all of the reports at aarp.org/security. To follow tweets related to the project, search #mc50plus and follow the new AARP Public Policy Institute twitter account @AARPpolicy, and my account @DrUrbanPolicy. But before you do all of that, share your comments below. Its a good thing that this group focus the housing issue. Its now easy to the family.